Order ‘K Blows Top’ from Amazon.com by clicking the book cover above! Peter Carlson could have taken all the research he did on Soviet Premier Nikita Khruschev’s two-week barnstorming tour of the United States in 1959 and converted it into a Cold War-era fable such as Dr. Strangelove or The Mouse That Roared. 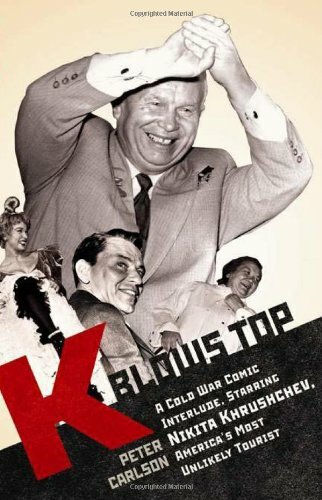 He could have done that, but truth is stranger than fiction and the truths found within K Blows Top: A Cold War Comic Interlude, Starring Nikita Khrushchev, America’s Most Unlikely Tourist are way funnier than even a guy like Dave Barry could have invented. I first discovered this book when the story of Chairman K’s visit to Hollywood was excerpted in Smithsonian magazine. I read that, laughed, and thought: I must read more! And now that I’ve read more, I want to talk about it, so welcome to Mr. Media’s Book Club, where I’m hoping former Washington Post reporter Peter Carlson will fill us in on the story behind the story of this ticklish new political history.